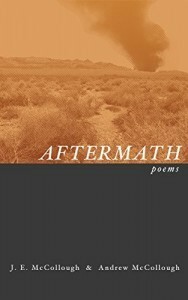 “Aftermath,” a collection of poetry by brothers J.E. and Andrew McCollough, gives an uncensored and unapologetic look at life in and after the war in Iraq. What makes this anthology different from the other collections of war poetry out there is its unique perspective: the contrasting points of view of J.E., a former Marine, and his brother Andrew, a civilian. In the truest tradition of the “warrior poet,” J.E. had a front seat at the war through his job as an interrogator and human intelligence collector with 3rd Battalion, 5th Marines in Task Force Tripoli. This perspective gave him face to face access with the enemy, his fellow Marines, and the civilians caught in between. Andrew McCollough picks up where his brother leaves off, providing the “other side” of the war; the part that begins when a warrior comes home. still leaking what new water seeks to fill it. and the echoes of old rain. I purchased a copy of Aftermath and you should too. You can get yours on Amazon or through the McCollough brothers’ personal website. This article first appeared in The Havok Journal on 3 April 2015.